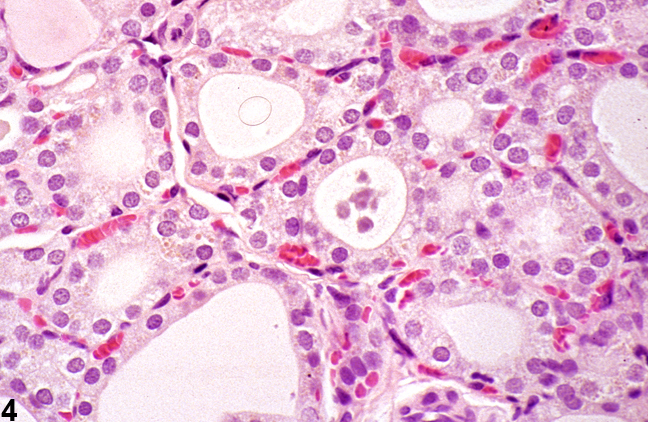 Thyroid gland, Follicle - Pigment in a male F344/N rat from a subchronic study. 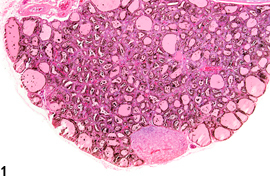 Dense pigment deposits are present in the follicular epithelium and colloid. 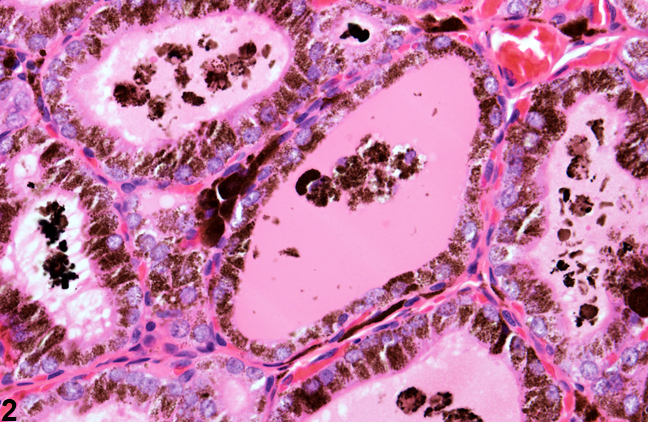 Thyroid gland, Follicle - Pigment in a male F344/N rat from a subchronic study. 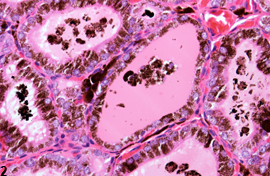 Higher magnification of the pigment deposits in the follicular epithelium colloid in Figure 1. Thyroid gland, Follicle - Pigment in a male F344/N rat from a chronic study. Fine, brown, granular pigment is present within the follicular epithelium. 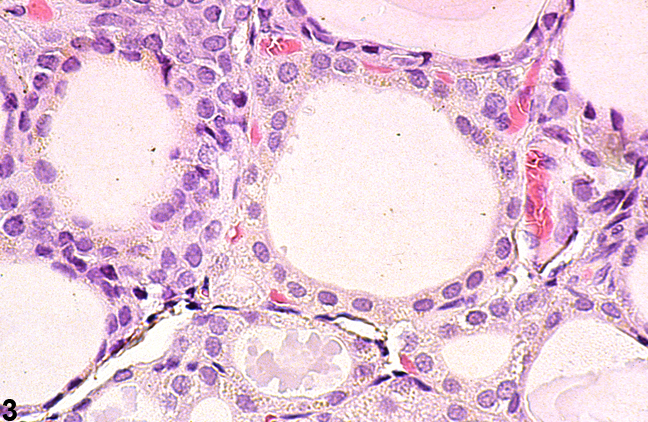 Thyroid gland, Follicle - Pigment in a male F344/N rat from a chronic study. Fine, granular, brown pigment is present within the follicular epithelium. 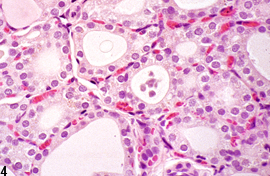 Thyroid pigmentation can occur as a result of iron and/or lipofuscin deposition in follicular epithelium or colloid. Dark black pigment with resemblance to melanin is seen in rodents and other species following exposure to minocycline, a semisynthetic derivative of tetracycline ( Figure 1 and Figure 2 ). At least 4 chemicals tested by the NTP have caused thyroid pigmentation. Subtle pigmentation can be seen as a background change in both control and treated rats ( Figure 3 and Figure 4 ). Definitive pigment identification is often difficult in histological sections, even with a battery of special stains. Therefore, it is recommended that a diagnosis of pigment (as opposed to diagnosing the type of pigment, e.g., hemosiderin or lipofuscin) is most appropriate. The pathology narrative should describe the morphological features of the pigment. Not all pigments have to be diagnosed, as some are ubiquitous in aging animals or related to some other disease process and not toxicologically meaningful. The pathologist should use his or her judgment in deciding whether or not secondary deposits of pigment are prominent enough to warrant a separate diagnosis. Tajima K, Miyagawa J, Nakajima H, Shimizu M, Katayama S, Mashita K, Tarui S. 1985. Morphological and biochemical studies on minocycline-induced black thyroid in rats. Toxicol Appl Pharmacol 81:393-400. Ward JM, Stinson SF, Hardisty JF, Cockrell BY, Hayden DW. 1979. Neoplasms and pigmentation of thyroid glands in F344 rats exposed to 2,4-diaminoanisole sulfate, a hair dye component. J Natl Cancer Inst 62:1067-1073.